“Connect, Georges,” says Dot to a brilliant, but obtuse pointillist painter in the musical Sunday in the Park with George. And in a similar way, theatergoers at Steven Dietz’s wise and witty comedy of missed connections, This Random World, will want to shout to the characters to open their eyes and understand what links them. Dietz’s intricately structured script, now receiving its second-ever production at FAU Theatre Lab on the Boca Raton campus, juggles eight vivid characters who are at the mercy of the capricious way of the world. 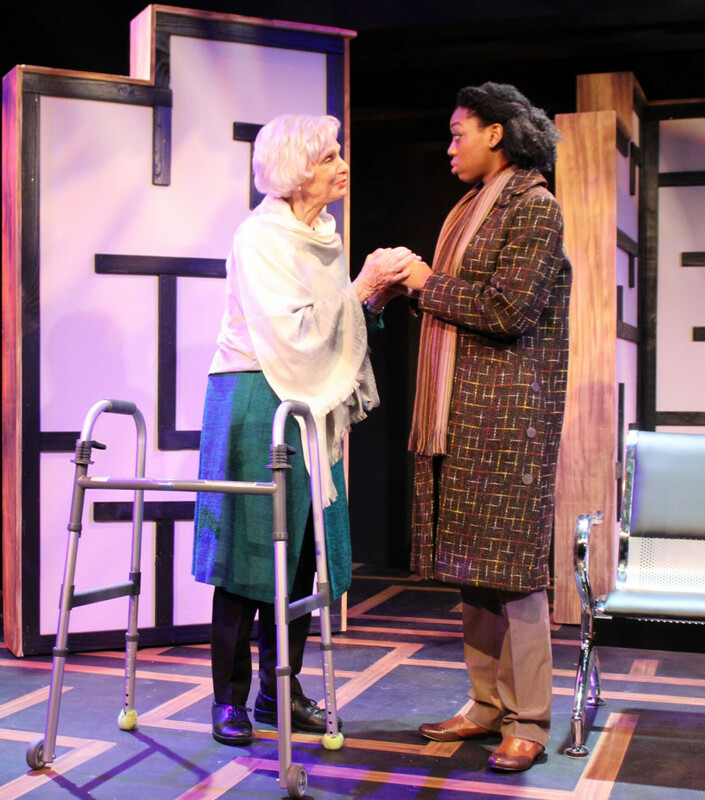 From the start, as a 38-year-old self-assured woman plans her own funeral, death hovers over the evening, yet the play brims with life — enigmas and all. That woman, Beth Ward (perky, quirky Elizabeth Price), is contemplating her demise largely because she is headed off on vacation to risk-fraught Nepal. Her younger brother Tim (fuzzy-headed Joseph Ferrarelli) scoffs at Beth’s suggestion that he too should prepare for the inevitable. With tongue in cheek, he posts his obituary online, a prank that will have perplexing consequences. And they both bemoan the fact that their mother, Scottie (Harriet Oser) has never seen “more of the world than the three-mile radius she’s lived in for the last 50 years,” unaware that she is secretly a veteran global traveler. Meanwhile, across town at a dreadful restaurant, a tech designer named Gary (Matt Stabile) is breaking up with his morose girlfriend Clair (Kelli Mohrbacher, who makes depression very funny). Coincidentally — a frequent element of the play — Clair was once a high school sweetheart of Tim’s and Gary is soon off on a bucket list adventure in Nepal where he will run into Beth. And then there is Scottie’s health aide Bernadette (Maha McCain), whose mother has recently died, and Bernadette’s sister Rhonda (Cherise James), who works at the funeral home where Tim goes to straighten out his obit snafu. The fact that Rhonda is convinced that he is actually dead is one of Dietz’s better comic conceits. Lastly, there is a character listed in the program only as “A Man” (Dan Leonard), but by the time of his 11th-hour entrance, we know he must have some link to the others. Dietz, a prolific playwright who has had several of his scripts (Lonely Planet, Private Eyes, Yankee Tavern) produced by Theatre Lab artistic director Louis Tyrrell, has a knack for tossing out profound statements with a lightly humorous spin. With This Random World, he writes a series of seemingly independent vignettes, which build in impact because of their wry interconnections. Tyrrell’s direction maximizes both the mordant comedy and wisdom, thanks in no small part to his very savvy casting. He employs well familiar faces from the South Florida stage community — Oser, Price, Stabile and Leonard — plus a couple of standout performers — Mohrbacher and James — from outside of the region. 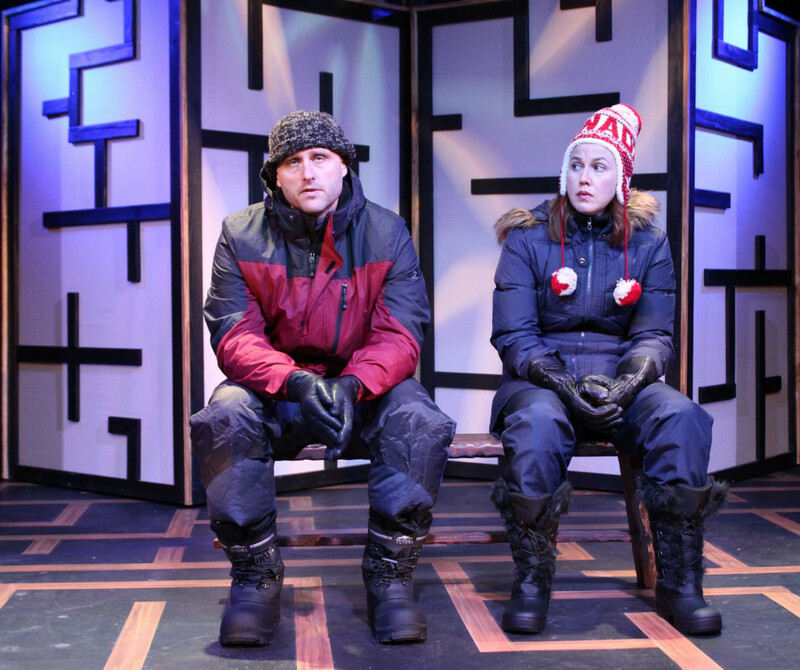 Robert F. Wolin’s ingenious set of several mobile units with a maze design manages to define the play’s ever-shifting performance spaces while also serving as a metaphor for its theme of interrelatedness. Since the demise of his Florida Stage five years ago, Tyrrell has continued to showcase new work in American theater by emerging writers and established voices such as Dietz’s. More often than not, he has been able to bring his audiences gems like This Random World, leaving them with a few laughs and something of consequence to mull. THIS RANDOM WORLD, FAU Theatre Lab, Parliament Hall on FAU campus, 777 Glades Road, Boca Raton. Through Dec. 18. $35. 561-297-6124.